I am playing along with Jenny Matlock's Alphabe-Thursday today. These casual jaunts through my neighborhood have opened my eyes to beauty I never knew was there. 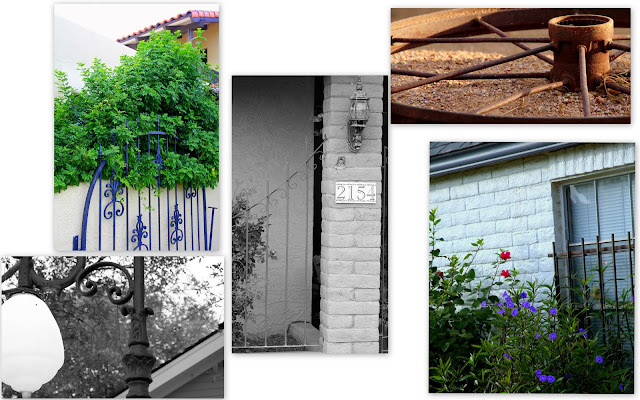 I 've discovered that I really love metalwork--the curli-qs, the fences, the lights. Who'da thunk these pics were taken in Arizona? One picture was taken in my yard. Can you guess which one it is? I know that Heidi reads my blog, but she rarely comments. I wonder if this next picture could tempt her out of hiding to share the "hugging the Statue of Liberty" story. 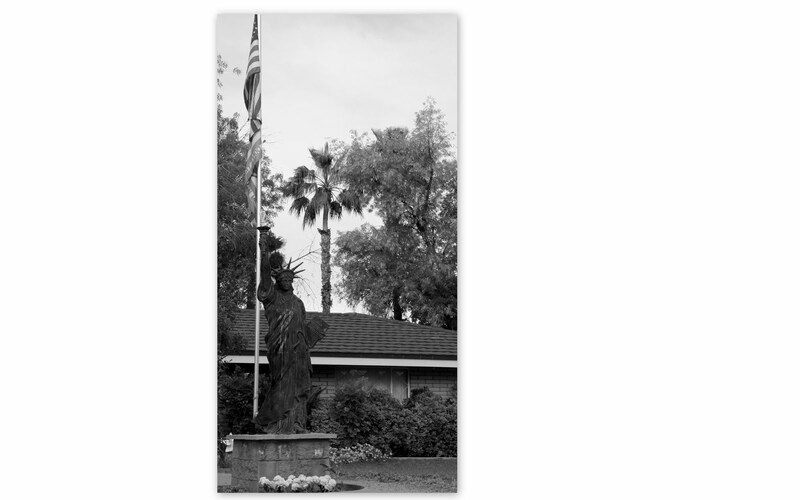 "Turn right on Hackamore, drive past the Statue of Liberty, take your second left . . ."
"You heard me. The Statue of Liberty. You'll know when you see it." I had to use this Q day to pay special tribute to the queen of meme, Miss Jenny Matlock herself. She eschews blog awards and refuses to participate in them. But I know that she takes the time to read each link on her posts. And answer them. And comment on them. Not only is she kind and creative, she truly has the kindest bloggers participating in her prompts. I got more comments and new blogs to follow from just one time participating in Alphabe-Thursday than I have anywhere else. And, as a friend of mine said once, "Kind is different from nice." You rock. Thanks for all you do to make the blogosphere kind and fun! I totally agree. I enjoy each of her posts. I enjoyed yours too. Jen..the photos are fabulous. I think we need to "house swap" You and your family come here to the East coast and we'll go to sunny warm Arizona! Whaddya think??? Wow, that is so unusual to see the Statue of Liberty outside of N.Y. What's the story behind it? I'm just catching up with your last few posts after being out of "Blogland" for a few days. I just genuinely enjoy your blog. I really think you are a kind person so I think it is great that you found a site that you have also found "kindness" at. I will have to go and check it out as it sounds truly wonderful. In the meantime I have enjoyed these picture posts - How fun to explore you world this way a little bit more. Hey! Wait a second! Two of those pictures look vaguely familiar... almost as if they were pictures of my house! Haha! Love it! 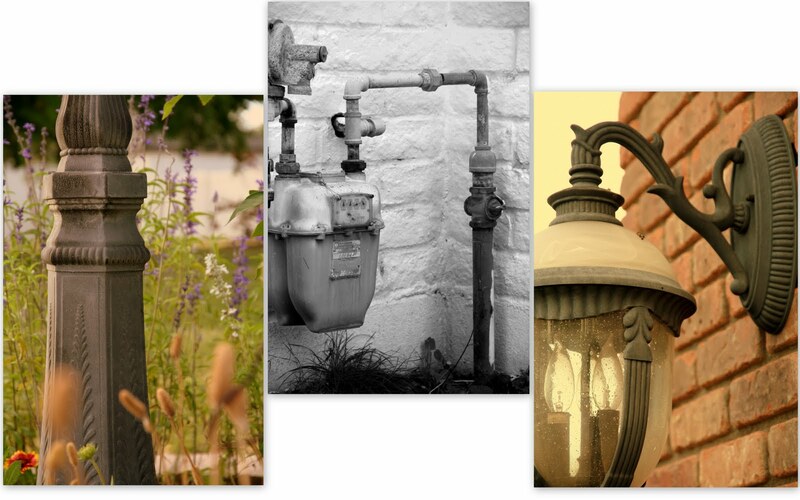 your home pic is the one of the lamp on red brick, I would guess. And hold the phone--you lived off Hackamore? Um, I lived ON Hackamore, down the street from our lady of Liberty. Did we know each other then? I know where you live now, because, you know, Mesa East Stake news travels. But when were you there? Hmmm...! oh how weird to have a statue of liberty right in your neighbourhood! and i totally agree, Jenny rocks the blog world! Really enjoyed visiting your blog today, for the first time. I thoroughly agree with you, Jenny is the sweetest hostess and visits us all. But just who owned the Statue Of Liberty and why? You must tell! you did say "Queen of Mean", didn't you? I follow her, too. I've been thinking about doing this for a while. Maybe that day is today since I don't have anything else to blog about. You're full of great ideas! I love the photos. No idea which one is yours, though. You have to tell us at some point though or I won't be able to move on. I agree with you about Mrs. Matlock! And what a nice post you made! Jenny is the queen! Your metalwork photos are gorgeous. Which one is yours... the one with the house numbers or the flowers? That Statue of Liberty is way uniQue. Thank you for the lovely post in images and words. It really is amazing how "pretty" things can be when you look at them with a different eye. I've enjoyed the pics. How have I never seen that statue of liberty before. Too funny. I love this linky party . I have not seen it before! You are very creative with your curly Q's. It's amazing what you can see in a metal pipe or fence post when you really start looking! I've been following your blog for a while, but have to comment today - you're right....Jenny stands out in Blog land! Gosh, I hope I can quit grinning long enough to comment here. Wow. What a totally lovely thing to say. And I know where the Statue of Liberty is. I think I told you I used to live on Hope Street! And we need to get together...I think your kids are close to the age of my Grands! That would be awesome! Geez, now I have totally forgotten what your post was about. Top section of photos, right hand is my guess! The flowers look right for this time of year! Thank you for participating in Alphabe-Thursday! And especially today when you are making me grin from ear to ear! Well, no kidding about Blog-Friends...unheard of, no one like 'em!!!! And I count YOU as one! GREAT pics....happy Thursday to you! I agree with you about Jenny. She is something else! PS. Your photos are really cool. And that Statue of Liberty is a riot! Great pictures! And I second that Jenny is amazing. She's so supportive and caring. I'm guessing that the black wrought iron fence/by the window/flowers is from your house. I love your pictures! These are very lovely:) The Statue of Liberty story is ADORABLE!! How funny to have a story like that...and what a fun neighborhood you must have lived in:) I look forward to hearing the story if your friend comes out of hiding...I agree with what you said about our meme! It has been a lot of fun for me and the friends I have made are wonderful!! I am loving seeing the neighborhood through new eyes. That purple fence always makes me smile. Do you know why they have that Statue of Liberty? I'd love to hear the thought process behind that decision. Well, a few of my friends and I were driving away from our house one evening, and T. spoke up as we drove by the statue "Do you know who lives there?" When I responded "No," he said "Let's get out and hug it." Of course we all laughed and drove on by. On the way back from where we were going, though, B. stopped the car. After a few minutes of debating T. and I got out slowly, crept toward Lady Liberty, and finally got to the sidewalk in front of it. We had almost touched her when we heard dogs barking. We gave each other a worried look and were immediately running back to the car. We sat there for a minute, regretting our run back to the when we had been so close, and soon enough we were out again and on our way back to the statue. This time we just took off running toward it. We both gave it a hurried hug and again ran back to the car when we heard the dogs barking. After that it kinda became an inside joke with all my friends: "Let's go hug the Statue of Liberty!" There was lots of walking, biking and driving by, but as far as I can remember we only did it that one time. Mrs. Jenny is the BOMB DOT COM!!!! I love love love the alphabe-thursdays, it is a happy smile in my week. I don't have a clue which is yours. Hmmm, hope you post and tell! is the statue of liberty yours? that would rule!!! 69 Followers and I'm the 35th comment? You truly are making your mark in the blogging world. Doesn't surprise me, I LOVE your blog! PS love the photos. We have a little Lady Liberty here in New Castle, but it's not in anyone's yard. I agree that Jenny is in a league all her own when it comes to hosting! The absolute best kind of hostess!! So yes, we want to hear this Statue of Liberty story! BTW- your family is beautiful! Heh, how random to have a Statue of Liberty in your front yard! I agree with you about Mrs M. She really is an amazing lady! Great way to use Q and to recognise Jenny! !